SpecificityThis assay has high sensitivity and excellent specificity for detection of MG(2+)-ATPASE. No significant cross-reactivity or interference between Mg(2+)-ATPaseand analogues was observed. NOTE: Limited by current skills and knowledge, it is impossible for us to complete the cross-reactivity detection between Mg(2+)-ATPaseand all the analogues, therefore, cross reaction may still exist in some cases. Intended UseHuman Mg (2+) ATPase ELISA Kit allows for the in vitro quantitative determination of Mg (2+) ATPase , concentrations in serum, Plasma , tissue homogenates and Cell culture supernates and Other biological fluids. specificalPrinciple of the assay: Mg(2+)-ATPaseELISA kit applies the competitive enzyme immunoassay technique utilizing a monoclonal anti-Mg(2+)-ATPaseantibody and an MG(2+)-ATPASE-HRP conjugate. The assay sample and buffer are incubated together with MG(2+)-ATPASE-HRP conjugate in pre-coated plate for one hour. After the incubation period, the wells are decanted and washed five times. The wells are then incubated with a substrate for HRP enzyme. The product of the enzyme-substrate reaction forms a blue colored complex. Finally, a stop solution is added to stop the reaction, which will then turn the solution yellow. The intensity of color is measured spectrophotometrically at 450nm in a microplate reader. The intensity of the color is inversely proportional to the Mg(2+)-ATPaseconcentration since Mg(2+)-ATPasefrom samples and MG(2+)-ATPASE-HRP conjugate compete for the anti-Mg(2+)-ATPaseantibody binding site. Since the number of sites is limited, as more sites are occupied by Mg(2+)-ATPasefrom the sample, fewer sites are left to bind MG(2+)-ATPASE-HRP conjugate. A standard curve is plotted relating the intensity of the color (O.D.) to the concentration of standards. 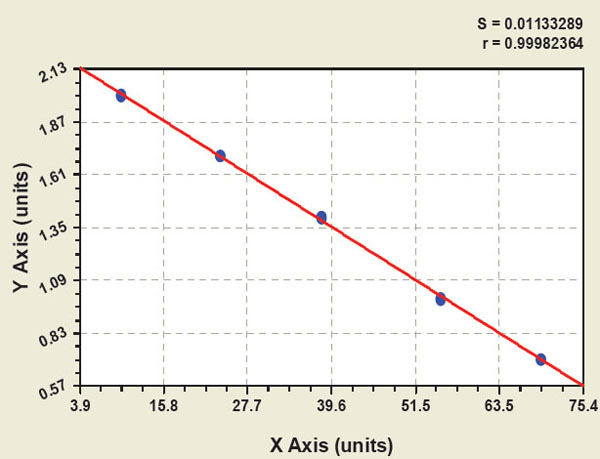 The Mg(2+)-ATPaseconcentration in each sample is interpolated from this standard curve. Inquiry About Human Mg (2+) ATPase ELISA Kit If you hope to order it or contact us directly, please contact us via sales@biobool.com. We will get back to you in 12hrs,Thanks!